These boats are similar to the avocado boats, though they have different shells and a different mixture! 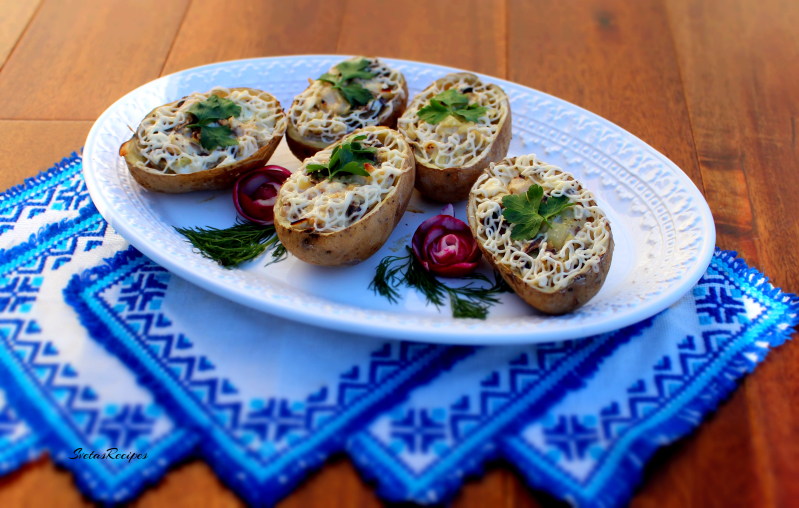 This is a very interesting dish because inside the boats there are many ingredients like mushrooms, chicken breasts and much more. 1.) Wash, dry and peel the potatoes and onions. Also wash your mushrooms. 2.) Slice your mushrooms into thin pieces. 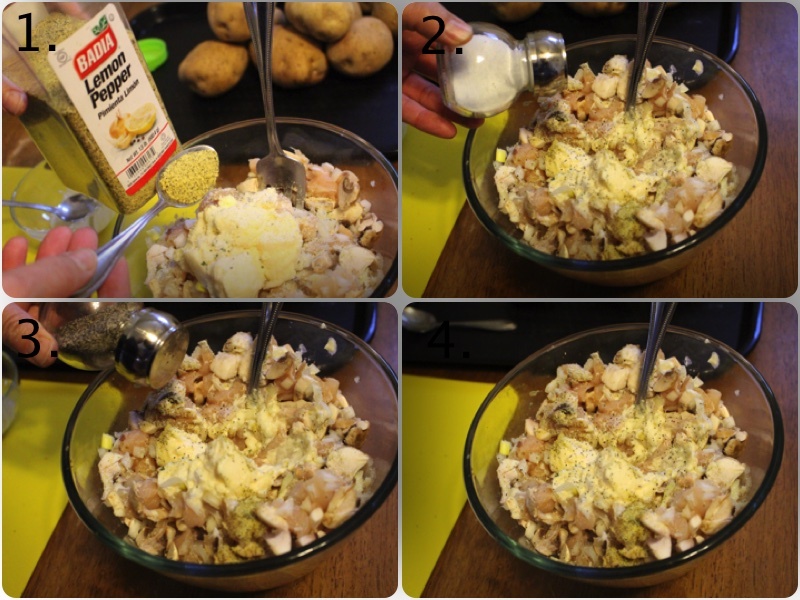 Chop your chicken breasts and onions into cubes. 3.) Place into a bowl and add mayonnaise and garlic salt. 4.) Also add lemon pepper, salt and black pepper. Then mix the ingredients well until they are combined. 5.) 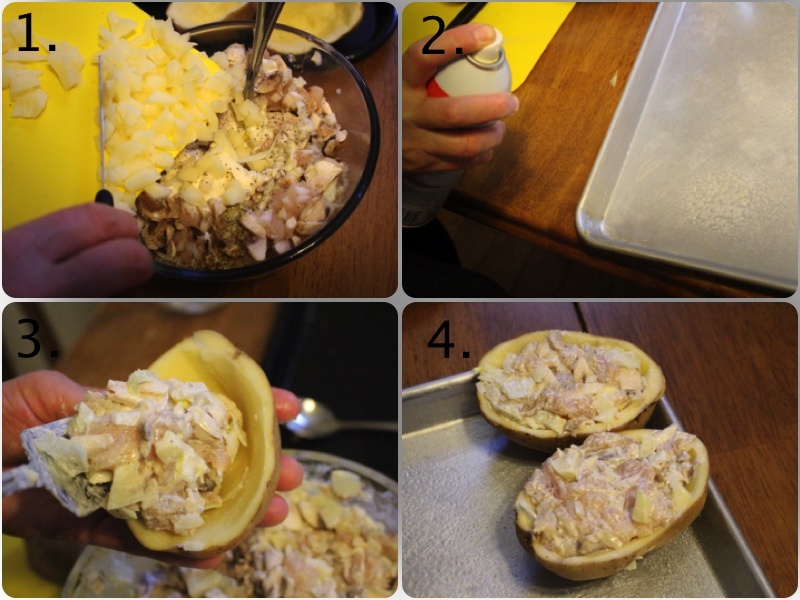 Slice your potatoes into halves, with a knife cut out the interior of each half to make 2 boats. Chop the left overs into small cubes and add to your mixture from earlier and mix. 6.) Spray your baking pan with cooking spray. Divide different portions of the mixture into each boat. 7.) Place all of your boats on a baking pan. Bake at 400F for 1 hour or until the potatoes are tender. 8.) Place on a serving dish and enjoy! Wash, dry and peel the potatoes and onions. Also wash your mushrooms. Slice your mushrooms into thin pieces. 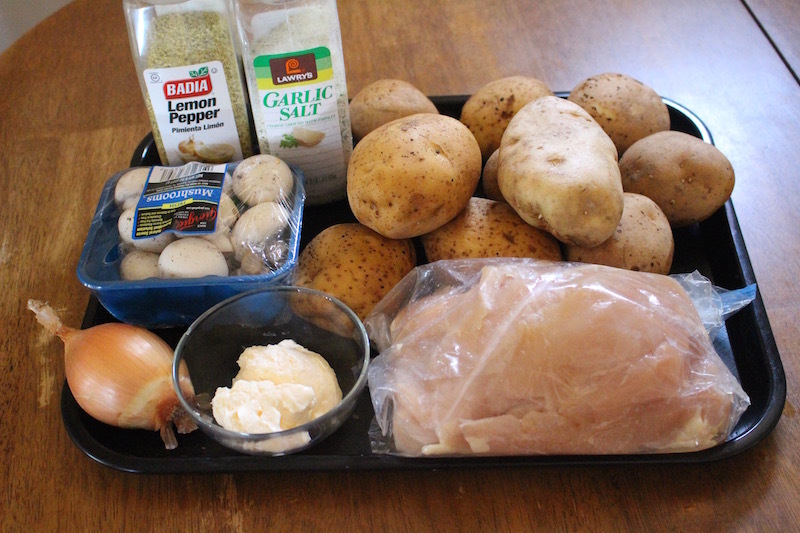 Chop your chicken breasts and onions into cubes. Place into a bowl and add mayonnaise and garlic salt. Also add lemon pepper, salt and black pepper. Then mix the ingredients well until they are combined. 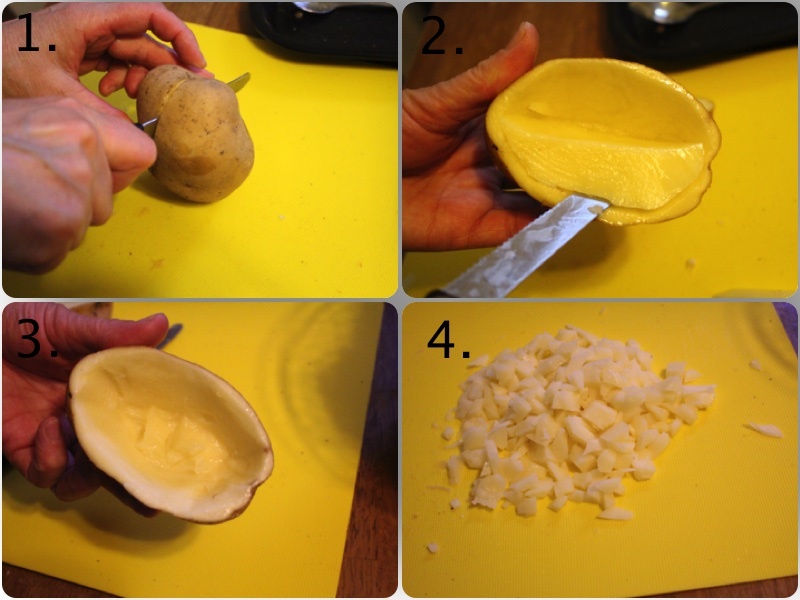 Slice your potatoes into halves, with a knife cut out the interior of each half to make 2 boats. 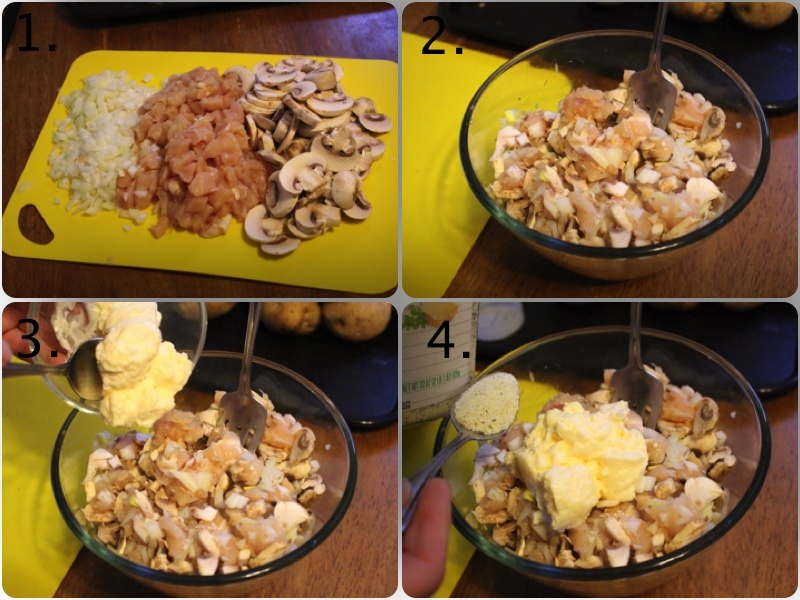 Chop the left overs into small cubes and add to your mixture from earlier and mix. Spray your baking pan with cooking spray. Divide different portions of the mixture into each boat. Place all of your boats on a baking pan. Bake at 400F for 1 hour or until the potatoes are tender.